Portions of former continents were broken up into smaller landmasses after the moon was destroyed and its fragments reigned down upon the Earth. (Fantastic Four I#273 (fb)) - Other Earth shares a similar (if not identical) history to Earth-616 up until around 300 A.D. At that point, for unspecified reasons, Other Earth did not enter the Dark Ages (a period of almost total disappearance of scientific inquiry as seen on Earth-616 from 300 to 1300 A.D.), but rather continued to develop, with great leaps of exploration and discovery. 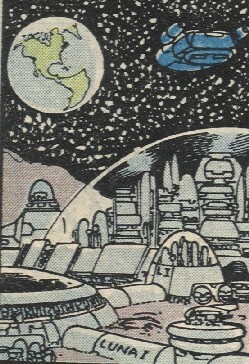 At the point corresponding to the mid 9th Century on Earth-616, men from Other Earth first landed on the moon. It is at that point that the people of Other Earth started marking their calendar. There was a time of great peace, as the lunar colony grew and prospered. However, eventually Luna (the moon and its people) declared she'd be forever independent of terra (the Earth and its people)--and then began the Great War! It lasted only six months, before the rebels, in suicidal desperation, exploded their most fantastic of weapons--and shattered the very world they fought to save. For ten long years the broken fragments of the moon formed a terrible cloud about the Earth...a cloud that blocked out the life-giving rays of the sun, and plunged the planet into eternal winter. In addition, each yearly sojourn around the sun carried the Earth through the gravitational influences of the other planets. With each season, the orbiting debris rolled and jostled against itself, and mountains rained daily from the troubled skies. The continents were shattered into great archipelagoes, strings of islands. Civilization, like the continents themselves, was shattered. Yet, miraculously, life itself survived--humankind continued to cling to the Earth. Divided into isolated pockets (many completely unaware of the existence of the rest of the world), groping in half-forgotten memory--part science, part legend, part fantasy--the survivors rebuilt their lives and their worlds. After two centuries, wars erupted among the differing societies. (Fantastic Four I#272 (fb) - BTS / #273 (fb)) <Other Earth calendar year 1117> - Nathaniel Richards--in an effort to travel forward in time--traveled instead from Earth-616 to Other Earth. (Fantastic Four I#273 (fb)) - His scientific curiosity piqued, Richards explored Other Earth. He wandered its war-torn lands for many months, helping to ease the suffering of those trusting enough to accept his aid. Eventually he encountered the people of the Eyrie, recognizing in them the high culture that was needed for the survival of humanity. Achieving an alliance, Richards was bound to the ruling family by a ceremonial marriage to their leader's youngest daughter, Cassandra. Richards then constructed the sky-steeds for the women warriors of Eyre and they set out on a mission to bring new hope, first to their own troubled land, then to the farthest corners of the world. On one large island they found the ruins of one of the old places--a structure that had survived almost intact from the lost years before the lunar war. Nathaniel and Cassandra made this structure their home, utilizing a labor force of the ape-like mutates they had found in the Southern regions. The women of the Eyrie continued their grand crusade. (Fantastic Four I#273 (fb) - BTS) - While Richards lost himself in scientific discovery and repair, Cassandra manipulated his discoveries to set herself as the Warlord. Using the illusion that the Warlord was actually Nathaniel, Cassandra savagely struck down one of the town sites nearby to their Fortress. As the Warlord, she declared herself ruler of the entire planet, and had shown in her attack that she had the power to make good this declaration. (Fantastic Four I#273 (fb)) - Three years after parting ways, the women of the Eyrie returned to find the ancient citadel of knowledge now a fortress, and the country around it a burned-out war zone. (Fantastic Four I#272, 273) <Other Earth calendar year 1127> - In an effort to locate his father, Reed Richards led the Fantastic Four (himself, the Human Torch, the Invisible Girl, and the She-Hulk) and Wyatt Wingfoot to Other Earth. They encountered Colby and his posse and the women of the Eyrie, and they destroyed some of the Warlord's Striders. After learning of the Warlord and mistakenly believing Nathaniel Richards to be the Warlord, they were attacked by the Warlords forces. 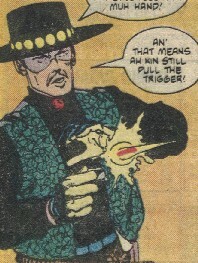 The Warlord was killed when Wyatt caused her anti-matter to backfire. The Warlord's true identity was exposed, and Nathaniel confessed that he had allowed his obsession with science and his love for his beautiful wife and their infant son to blind him to her actions as the Warlord. Nathaniel decided to stay on Other Earth, to guide his son to a better future. (Fantastic Four I#390 (fb) - BTS) - Nathaniel brought his grandson, the young Franklin Richards of Earth-616, as well as Huntara (native to Other Earth) to the realm Elsewhen, to be trained by Warlord Kargul. (Avengers I#269 (fb)) - The work of Nathaniel Richards and his descendent and allies eventually brought forth an age of peace and enlightenment. (Young Avengers Director's Cut#1) - In Other-Earth calendar year 3000, a second Nathaniel Richards (an alleged descendant of the first Nathaniel Richards (see comments)) was born. (Fantastic Four I#19 / Young Avengers Director's Cut#1) - In Other-Earth calendar year 3025, the second Nathaniel Richards became bored with the peace of his time and sought action. Traveling to the ancient "Warlord's Fortress," he discovered the time machine of his ancestor, "Nathaniel the Benefactor," and used it to travel back in time to 2950 B.C. 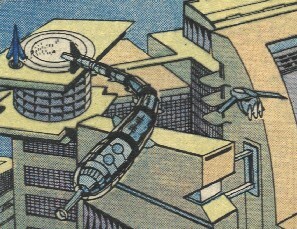 (Fantastic Four I#19) - With some modification, Nathaniel 3000 used his ancestor's time machine to travel back in time where he became Rama-Tut. (Avengers III#42)- In his confrontation with 20th century Earth, Kang revealed to humankind many of the alternate futures he had learned of-- including that of his own world, Other-Earth, and told them of the moon's destruction. Fleshed out by John Byrne. I'm not positive whether the year 3000 (the time period of Nathaniel Richards (II)/Kang, etc.) is in-line with the calendar of Earth-616 (making it about 1000 years after Nathaniel Richards first came to Other Earth) or the calendar as related by the women of the Eyrie, making it 1873 years after Nathaniel Richards first traveled there. If the latter, it would correspond to the 39th Century in the Earth-616 timeline. According to Avengers I#269, as related by Kang, it is the former, which would make it the Other Earth calendar year 2127 (or thereabouts). However, Uatu the Watcher, who has LESS reason to lie, described it as the latter. That's the version I believe. Confused? Good...me too! In Avengers I#269, Kang himself verified the history of Other Earth as it had been related by the leader of the women warriors of the Eyrie. Uatu the Watcher also confirmed these events, in What If? II#39. While a discussion of the origins and history of Kang, etc. is WAY beyond the scope of this profile, one item of interest is his differing claims to be the descendent of Nathaniel Richards or Dr. Doom (both from Earth-616). Uatu the Watcher stated Kang/Immortus/etc. to be the descendent of Nathaniel Richards in What If? II#39. A flashback to Reed Richards Rocket Groups meeting with Nathaniel Richards (II) in What If II#39 occurs in Avengers Annual#21/7 (1992). In that story, a new light gets thrown on what occurred in this issue. Ravonna/Terminatrix reviews Kangs history tapes, as Kang himself has gotten placed in suspended animation after a serious injury. As she inquires of Kang's servant robot as to whether or not Doctor Doom or Nathaniel Richards served as Kang's ancestor, as Kang at one point in his video memoirs refers to Doom as his ancestor, she gets this response. "So it was believed in the masters native timeline. 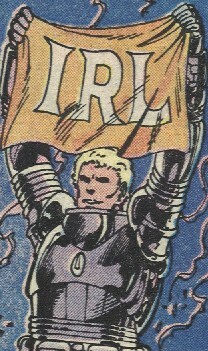 He was even named after Nathaniel Richards. But the Fantastic Four of an alternate reality once visited the master long before he became Kang. Of course he knew who the Fantastic Four were from historical records but he feigned ignorance to learn their plan. 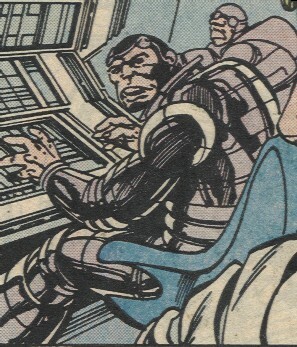 This Reed Richards sought to convince the master that they were related so he could help them destroy Immortus. The master decided to humor Richards so he claimed his genetic analyzer proved they were related. But the master had already lied about recognizing him. Perhaps he lied about what the analyzer said. Perhaps Doom also traveled to Kang's timeline in the past." When Ravonna asked "And did he?" the servant robot responded "I cannot say". This story also showed Immortus still alive, as he observes (presumably from Limbo) Ravonnas questioning of the servant robot. When Immortus' companion (another version of Ravonna) comments that "That poor woman, Immortus. She truly believes that Kang is no more", Immortus responds "Yes, Ravonna, just as many believe that I too am dead, or the Avengers believe me to be their enemy". Immortus has later appeared in the mini-series Avengers: Terminatrix Objective and Avengers Forever, so presumably the Time Keepers resurrected him at some point after Timequake. This would have had to have been on one of the original Nathaniel's return trips to Other Earth, as he would not have had knowledge of Doom, the Avengers, or others, since he left Earth-616 prior to Fantastic Four I#1. In general, no one from Other Earth is connected to anyone from Earth-616 unless specified. The apparent law (or just the leader of a small group (his posse) in the cowboy town, he killed the Kid in a draw for calling him a liar and a cheat. He then led his boys to fire on the Invisible Girl for interfering with the shootout. 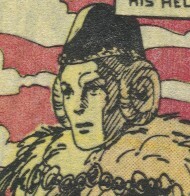 After explanations were made, he joined with the Fantastic Four and the "Eyriennes" against the forces of the Warlord. 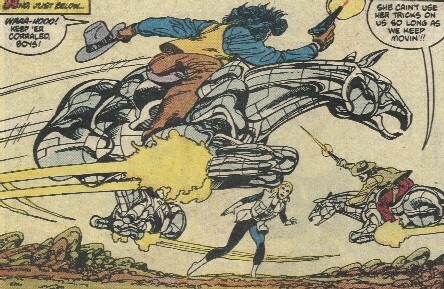 He was a quick shot and a skilled mechanical horseman, and he used a hand-held heat-seeker weapon. 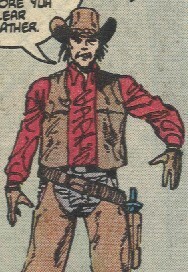 Another native of the cowboy town, he was renown for his quick draw. However, when he insulted Colby, he met his match. Colby outdrew him, and even though Sue Richards tried to stop the bullet with an invisible force field, its heat seeking device led it to pass above the field and hit the Kid, killing him. The lunar colony on Earth's moon. It eventually evolved into a strong society, and they fought a civil war against Earth (terra) in an effort to gain their independence. However, in the process of unleashing their most powerful weapon against Earth, they actually exploded the moon. The fragments of the moon rained down on earth, causing massive destruction for many years. Native to "the Southern regions" they have been described as ape-like mutates and a sub-species of homo sapiens. Their origins are unrevealed, though mutation following the war(s) seems likely. They are primitive in mind and body, but Nathaniel Richards of Earth-616 designed psycho-neuro stimulators that can raise the intelligence level of the wearers so that they can operate his advanced equipment. Gont is the only one named, and it is he that is pictured here. The "Eyriennes" are a matriarchal society that developed amidst the two hundred year wars, they lived in a fortress atop some craggy mountains. 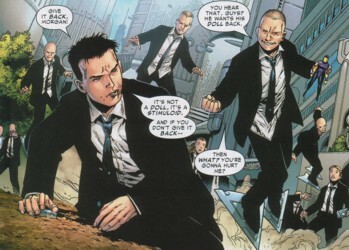 They were identified by Nathaniel Richards of Earth-616 to have the high culture needed to salvage Other Earth. Their leader bound Richards to her family via a ceremonial marriage to her daughter, Cassandra. Richards designed and supervised construction of sky steeds for them, and they embarked on a quest to rebuild Other Earth. They left Richards and Cassandra at an island base while they continued their mission. When they returned three years later, they were quite displeased to learn that Richards had become the Warlord and sought to take over the world. They apparently opposed the Warlord for some time before encountering the Fantastic Four in their year of 1127 and explaining the situation to them. With the Four's aid, the Warlord was slain, and exposed as Cassandra. Nathaniel Richards proved to still be the benevolent scientist he was in the past, and the Eyriennes presumably rejoined him in their continuing effort to bring peace and civilization to Other Earth. Tara (Huntara) would appear to have been affiliated with the Eyriennes. The leader of the Eyriennes and mother of Cassandra and another, it was she who made the alliance with Nathaniel Richards. She calmed her elder daughter when they encountered the Fantastic Four, and explained the situation with the Warlord to them. The elder daughter of the leader of the Eyriennes, and the sister of Cassandra, she is easily angered, and sought to kill Reed Richards after learning of his relationship to Nathaniel, whom they had believed to be the Warlord.